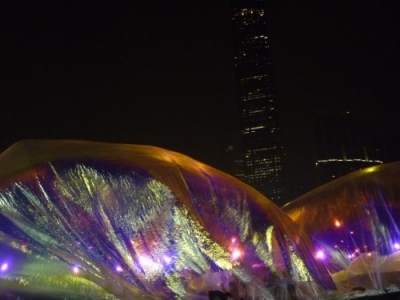 Poetic Cosmos of the Breath… uses … a paper-thin foil membrane accompanied by a few sandbags and a handful of participants — to produce a startlingly ethereal, shimmering effect. 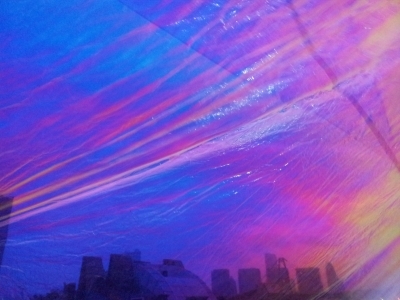 Staged at dawn, as temperature conditions naturally shift, air inside the balloon is heated by a greenhouse effect and the lightweight material slowly lifts off the ground unaided by machines or electrical power. 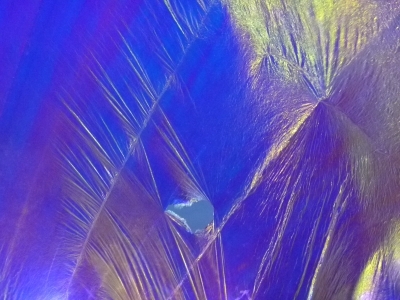 At the same time, sunlight cast through the material creates a vibrant rainbow-tinged iridescent glow. Expectation was set and it didn’t disappoint me. The visual impact was amazing, but I felt disquiet. The performance was rescheduled because of unfavourable climatic conditions. At the show, with the aid of the crew and a handful of participants, the cosmos began to breathe. Shortly after air blew in, the thin foil started to crack at the point where sandbags were not properly placed. But the wind was suddenly so strong that the crack amplified. Soon enough the dome had to be reduced by half as there were many unmanageable situations brought by the wind. The cosmos acts as a magnifying glass for me to question the relationship between human and nature. In this performance, the cosmos sets the stage as a miniature of the earth; wind or air represents nature; participants play as themselves. This hole reminds me of all Armageddon-like hostile climates. The plot: Participants, or human, expect to have some fun, camera’s ready. However, in the name of art, nature sends wind to the set but human ignores it. (After all, they think wind plays a key part in this act.) A few people manage to “rescue” the cosmos but then they realize effort is futile. It is a piece of act far from harmony. Vividly and sarcastically, I was caught unprepared with a lot of thoughts bubbling up: Unless the air inside and outside reaches its equilibrium, the cosmos will collapse. Referencing the video the work firstly presented in 2007, it is obvious that such unmanageable cracks are out of the artist’s constructed situation. The harbour front in West Kowloon isn’t such a place of steady and mild wind. M+ then becomes the sandbag who tries very hard to stabilise its position in the city … yet the effort is doubtful. 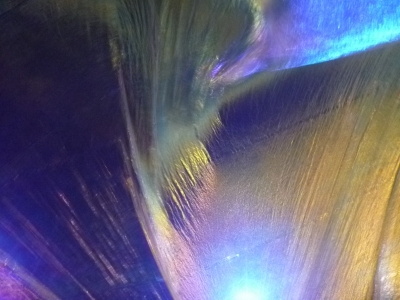 When I was sitting inside the shrunken cosmos, my thoughts led to a broader topic: The foil/earth is damaged. Shall we blame the wind for being too strong? Or shall we ask why exerting external forces against the thin foil? Which is the cause of the vicious cycle, human devastation harming the environment or natural disaster killing people? Some people show their concerns while others simply live with it. Which role am I playing in life for all kinds of social and environmental issues? It’s almost sunrise. The sun reflected a “vibrant rainbow-tinged iridescent glow” on the dearly cosmos as promised. The foil was a device to visualise air current (at dusk) and solar energy (at dawn). However, because of the shrunken space and the solar heat, trapped air was getting warmer and stiffer. We, as participants, applauded, walked out at ease and left behind the victim of a cruel breath. Yet, the act of nature and human continued. On my way out, House of Treasures (the roasted suckling pig by Cao Fei) could only be associated with dead pigs floated in Shanghai river few months ago, for an unspoken reason. Falling into the Mundane World (by Tam Wai Ping) would be a perfect example of genetic mutation or radiation leak that cockroaches grow as big as human, headless. P.S. In the same morning, my grandmother decided to catch With the Wind (Liu Jiakun’s work which was blown away) in heaven and be with God. Salute to her century-long strong will and body!